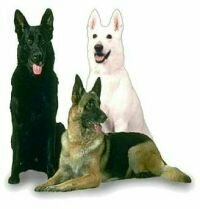 Within dog lover circles there is an ongoing controversy about whether it's better to acquire a pure bred German Shepherd or one of mixed ancestry. The issue may never be settled to everyone's satisfaction. But where you stand may depend heavily on the reason you acquired your dog. For show dogs, police dogs and other specialized work a pure bred is generally the preferred choice. Shows are interested in displaying the finest possible examples of the breed and only very specialized categories admit mixed breeds (and then, rarely). Even pure bred German Shepherds with white coats aren't admitted to many shows. Some highly trained specialty acts that aren't purebreds may perform, but they don't take prizes in the regular categories. Police dogs, whether trained for simple guard duty, drug search or other tasks, are almost always purebreds. True, you read articles or see films from time to time about a special exception. But they're talked about because they are the exception. Most are acceptable only if they meet a very strict set of guidelines about body characteristics and parental background. Others don't make the cut. But for those just looking for a companion, the guidelines are looser. Some mixed breeds are actually very beautiful. Though rare, a cross between a German Shepherd and an Irish Setter makes for an unusual, long-haired beauty with a sweet disposition. German Shepherds don't have the tolerance for cold that, say, a Huskie would and getting a mix may be a good idea for those who live in the far north. Mixed breeds may combine the best of both types, if the sire and dam for several generations back are chosen carefully. Mixing genes from different lines lessens the likelihood of certain diseases. That's why mating is discouraged between closely related males and females. Genes that increase the odds of a disease and that are 'recessive' are more likely to be passed on and get expressed when both parents have them. But mixed breeds are most often so because their ancestry is simply unknown. Here you get into risky territory. Certainly a mixed breed dog, from a shelter or private individual, can be a stellar companion. But the odds of behavioral problems increase, simply because you don't know the dog's history. Problems can occur in purebreds too, of course. Some unscrupulous breeders will mate anything to anything just to make a buck, when they can get away with it. But most breeders are reputable and take great care to thin out genes that would lead to Hip Dysplasia and other genetically sensitive conditions. If you choose a dog of unknown or mixed parentage, that's a perfectly valid choice. But be prepared for a possible increase in problems to deal with. Dogs from shelters have often come from homes where they weren't cared for and have absorbed bad lessons. Dogs of mixed parentage may well have weaknesses that aren't obvious as puppies, since their breeding is usually unmonitored and uncontrolled.